Photosynthesis requires light, but plants don’t use all the colors that make up white light. Use a spectroscope to explore the absorption and transmission of white light through leaf material. Use the hole punch to make a hole in the center of one of the stickers. Position the diffraction grating on the adhesive side of the sticker so it covers the hole you just made, then press it into place. Center the sticky side of the sticker with the diffraction grating over one end of the tube. Press and crimp the sides of the sticker around the end of the tube to secure it in place. This creates your eyehole. Use scissors to cut the second circular sticker in half, so that you have two semicircles. Position the two half circles, adhesive side down, over the end of the cardboard tube opposite the diffraction grating so there is a very small gap between them, creating a narrow slit. Don’t press the edges of the stickers down yet. Check your spectroscope and reposition the stickers as needed to align the diffraction grating and slit. (The diffraction grating has many small parallel scratches in the surface. The spectroscope works best if the slit created by the two half circles is parallel to the scratches in the grating. 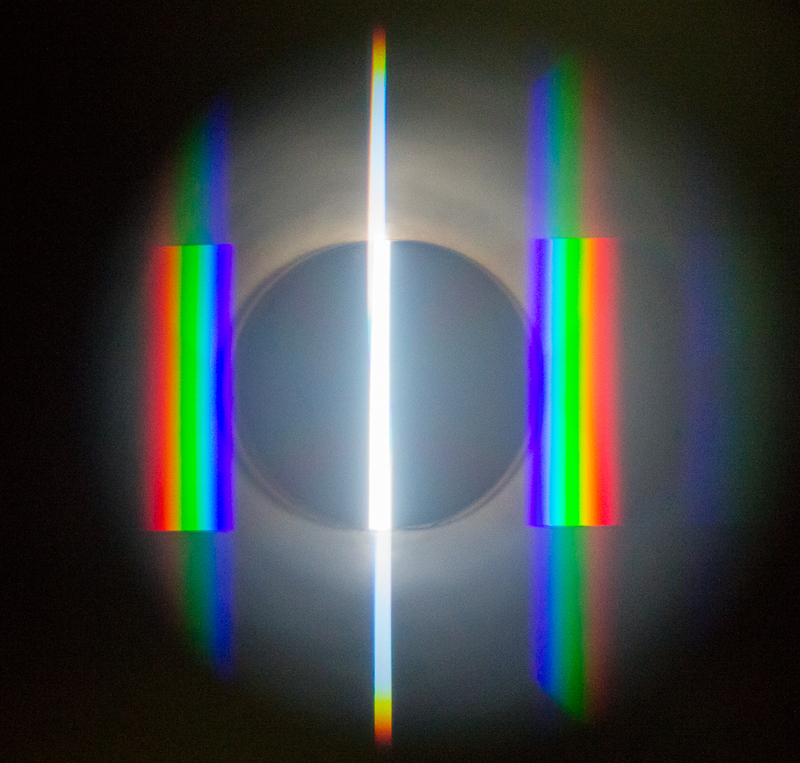 Although the scratches are too small to see with your naked eye, check the alignment by pointing the slit end of the spectroscope at the sky, clouds, or a brightly lit surface (NEVER directly at the sun) and looking through the hole with the diffraction grating. Look for the spectrum off to the side of where you see the slit. Adjust the position of the stickers until the spectrum looks like bands of color, not stars. Refer to the picture above. When you are satisfied with the look of the spectrum, crimp the edges of the sticker halves over the end of the tube to secure them in place. Cut three pieces of each type of leaf, each large enough to cover the slit at the end of your tube completely. Cut a piece of white paper to the same approximate size as the leaf pieces. Point the slit end of the spectroscope at the sky (NEVER directly at the sun), at clouds, or at a light-colored surface in the sun (like a sidewalk or the wall of a building). Bring your eye right up to the other end of the tube next to the hole with the diffraction grating on it. What do you notice? What colors do you see? Place the piece of white paper directly over the slit on the spectroscope as you point it toward a bright light source (not directly at the sun). What do you notice? Remove the white paper and replace it with a layer of leaf material, making sure the leaf completely covers the slit. You may need to tape the leaf over the end of the spectroscope to prevent light from leaking around its edges. Point the slit end toward a bright light source (not directly at the sun). Does the spectrum you see look different now? Add another piece of the same type of leaf to the one already covering the slit of the spectroscope. What do you notice? Add a third leaf of the same type. How does what you see now compare with the full spectrum? Try this with the other types of leaves you collected. White light such as sunlight is composed of all colors. When you look through the spectroscope at the bright sky, clouds, or a sidewalk on a sunny day, you see a full spectrum of color. The wavelengths of light in the visible spectrum range from about 400 nanometers (violet) to 750 nm (red). Green plants appear green because the leaf pigments are reflecting green light. Green light is also transmitted, but it is not absorbed. As you added layers of leaf material, parts of the spectrum were no longer visible, as the plant leaf absorbed them. Blue light is absorbed (not transmitted) when the light passed through only one layer of leaf material. More blue and some red are absorbed by two layers of leaf material. Through three layers of leaf material, only green is transmitted, indicating that both blue and red are absorbed. The most important plant pigment is chlorophyll-a, which exhibits a grass-green color, and absorbs light in the blue and red parts of the spectrum. The absorption of chlorophyll-a peaks at wavelengths of 430 nm (blue) and 662 nm (red). It occurs in all photosynthetic organisms except photosynthetic bacteria. Chlorophyll-b exhibits a blue-green visual color and its absorption peaks at wavelengths of 453 nm (blue) and 642 nm (red). It occurs in all plants, green algae, and some prokaryotes. There is usually about half as much chlorophyll-b as the -a variety in plants. Each successive layer of leaf material transmits some percentage of the green light. When you add a second layer, the percentage that is transmitted is squared, not doubled. A third leaf layer transmits the cube of the original percentage. For example, if 70% of the green light is transmitted through one layer of leaf material, two layers will transmit 49% (70% x 70%), and three layers will transmit 34.3% (70% x 70% x 70%) of the green light. Try using different colored leaves in this activity. Do red leaves give you the same results? Is there a difference between the leaves from shade plants and leaves from plants that grow in full sun? Do not look at the sun through the spectroscope. Any large bright area—the sky, clouds, or a lightly colored surface like a sidewalk or the side of a building that is in sunlight—will reflect enough light for this activity to work. Indoor lighting isn’t bright enough for this activity. However, another great exploration is to use the spectroscope to see what colors of light are emitted by different light sources. Show that gas is produced during photosynthesis.